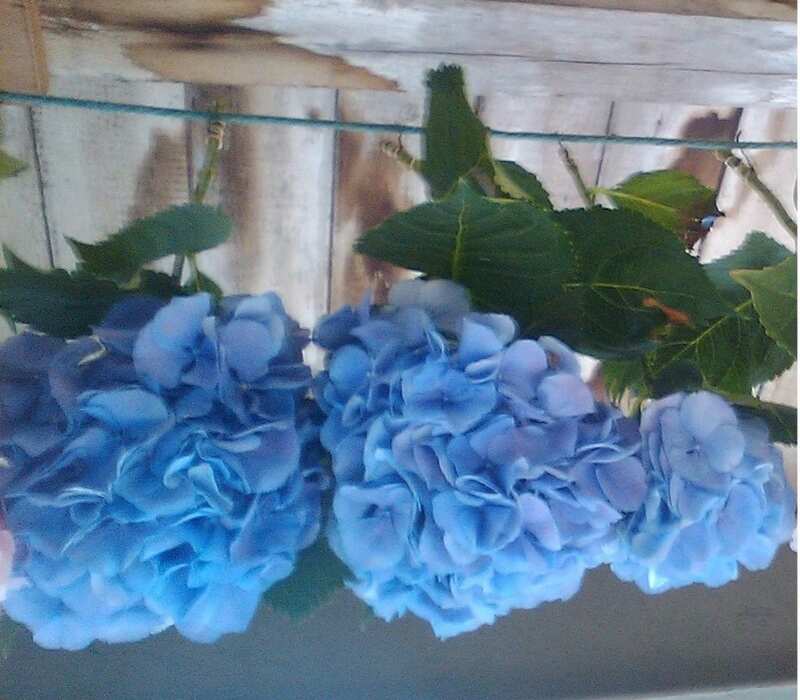 On my third attempt, I finally managed drying hydrangea flowers successfully. Hydrangeas are really popular for decorating the home, and are increasingly popular for wedding decorations & confetti. I must admit I didn’t do my homework before my first attempt at drying hydrangeas! I thought you could just hang them upside down in the same way as roses, delphiniums and other garden flowers (see my post on how to dry flowers). I hung some pretty blue hydrangeas upside down to dry in my workshop, and watched over the next few weeks as each bract collapsed shut. These dried hydrangeas are still beautiful, with fabulous retention of colour, but a different shape. By this stage I had looked the subject up: I read that you have to use older flowers and leave them in a half full vase of water to dry naturally. I took a pale pink hydrangea stem and removed all the leaves, then left it in a vase and went on holiday. Unfortunately when I got back, the result was not pretty! I had made two mistakes: firstly I had done the experiment too early in the season, and so the flower and stem were still sappy, and secondly I had used a narrow-necked vase which caused the stem to rot before the flower could dry. I was too disheartened to take a photo of that one. This time I seem to have got it right. I could tell my hydrangeas were naturally starting to dry on the bush, as the pink colour above was changing to a lovely leaf green – so they were no longer sappy. I cut about half a dozen stems and put them in this jug with about 3 inches of water. It has been on display in my sitting room for the last few weeks, the drying process seemingly unaffected by light. After leaving for 2.5 weeks, the water in the jug has long ago evaporated and the bracts are crispy to the touch, although they look no different. Success! 1. Do not hang the flowers upside down. 2. Wait until near the end of the season when the petals and stems are less sappy. 3. Display the drying flowers in a vase which has a wide enough neck to allow air circulation. 4. Fill the vase with 2-3 inches of water (or less than half full) and do not replenish. We sell professionally preserved hydrangea flower heads and petals in our shop. You can rest assured I have been nowhere near the process! I think it’s all about the timing – leave them as late as you dare but beware heavy rain and frost will damage the flowers. Likewise we dry them in vases without water. Nice to hear from you Richard.